In this set of five photographs, Gavin Berberich of Topeka, Kansas is featured playing baseball at various ages ranging from age 2 through age 10. Four of the photos were taken in Shawnee County; the other was taken in Omaha, Nebraska. Digital reproduction of the photographs was accomplished through a joint project sponsored by the Kansas Historical Society and the Shawnee County Baseball Hall of Fame. 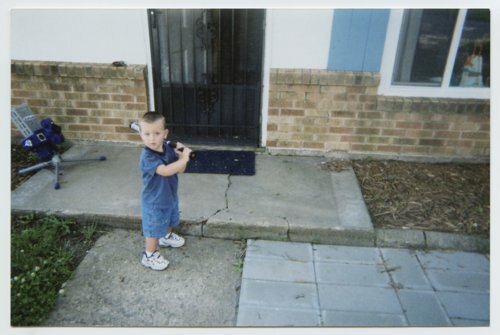 Gavin Berberich playing baseball - Playing with bat at age 2.